It’s Climate Week in the UK, and I’ve been busy working with several enthusiastic colleagues to organise photo exhibits, seminars and leaflets for DFID staff to better understand climate change and their impacts. It’s been great working in a team – we’ve done so much more than we would have if we’d tried to set these up separately, or if just one of us had taken initiative. Working together has made a real difference. But there’s another way that we – as government employees – have been working together, even if we didn’t really know it, through the things around us. Let me explain. In total, governments around the world buy an estimated US$4-5 trillion worth of goods and services per year. That’s over 5% of total world GDP. In the UK alone, public bodies bought £251 billion worth of goods and services in 2009/10 – equivalent to about 15% of UK GDP. Of this, central government spent about 60%, and the rest was spent by local public bodies. The sorts of things that governments buy range from papers and pens for staff and school children, uniforms for nurses and doctors, products to keep offices and other areas clean, as well as materials for building or refurbishing schools, hospitals or transport. Most developing countries spend between 25-30% of their GDP in this way. In all governments there are people, in an office somewhere, that are responsible for buying – or procuring – these things. How green is your office? 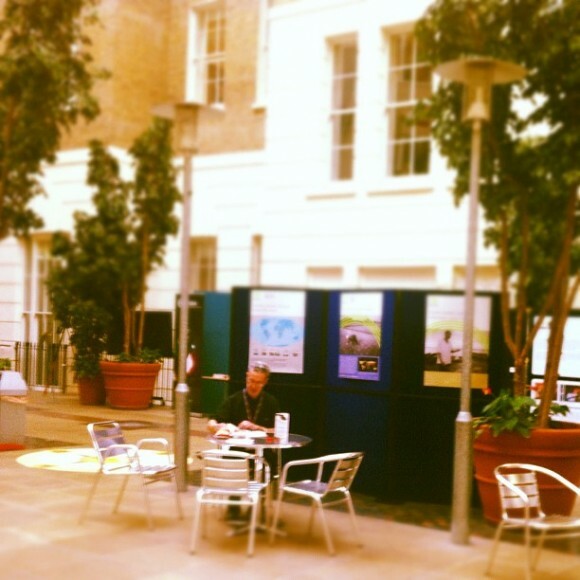 An exhibition for Climate Week in DFID’s London Office. Given its scale, government procurement is influential. It can stimulate innovation, make businesses invest in new types of products, reshape value chains or expand existing markets. Government purchases therefore need to be transparent and open to competition – as this encourages value for money and minimises rent-seeking opportunities. Added to this, government purchases have global environmental effects. For example, the materials used to make products might run out in future. The products might have been delivered by air, or might not be able to be recycled. Whether a pen or a school, these decisions have an impact on climate change and the environment, and therefore on poverty reduction. So, 10 years ago, a process called the Marrakesh Task Force was launched to see how government purchases can be made more “sustainable”. The UK was the first developed country to sign up, alongside a wide range of other countries such as Brazil, Mauritius, Philippines and Switzerland. Other countries such as Ghana have been working with other organisations such as the International Institute for Sustainable Development (IISD) on this policy. And UNEP are now taking forward some training initiated by the Marrakesh Task Force. Sustainable procurement policies have had beneficial effects. For example, since the Korean Government introduced a mandatory eco-friendly procurement scheme in 2004, the production of qualifying products in Korea increased from US$1.4bn in 2004 to over $21bn in 2010. Korea has also saved around $27m because the products were more efficient, and emissions were reduced by almost 3 million tonnes of CO2 – equivalent to taking off around 100,000 cars off the road per year. Similarly, the local government of Minas Gerais in Brazil saved US$61m on their purchases in 2007/8 by bringing in sustainable purchasing policies. We have learnt a lot from these experiences. For example, that it’s more important to focus on a discrete number of products that have significant impact – as a huge list can prove unmanageable. It’s also quite difficult to use the same approach in every country and, in some countries, legal changes may be needed to bring in these policies. As a result of these positive results and lessons learnt, countries such as Kenya are now including sustainable procurement as a part of their national climate change strategies. We can probably expect the Earth Summit, to be held in Rio in June 2012, to signal a commitment from many more countries across the world to these policies. However, for DFID staff like myself, especially those that don’t work directly on climate change, purchasing by our Government offers a new way that we can collectively work together to have a positive impact. In 2011, the Coalition Government committed to procure sustainably. The UK now has sustainability criteria for around 60 products and services, which are updated on a rolling basis in consultation with industry. Like Korea and Brazil, we have made economic savings by implementing these policies. Last year, DFID’s Secretary of State said that DFID employees should be judged for how well we administer British aid and by how effectively we work with other Government departments to ensure domestic policy also promotes poverty reduction in developing countries. I guess the sustainability of what we use in our offices every day might just be another means to judge us by.